‘Bevin Boys’ was the term given to the group of young men who were conscripted to work down the pits during the Second World War. Nearly 48,000 Bevin Boys performed vital but largely unrecognised service in the coal mines, with many not being released from duty until years after the war. On Wednesday 20th June 2007, former Prime Minister Tony Blair informed the House of Commons that the thousands of conscripts who worked down coal mines in World War II would receive a special honour. The 'Bevin Boys' would be rewarded with a commemorative badge. The contribution they made was vital to the country’s war effort, yet only in recent years have they been recognised for the significant role they played. At the beginning of the war the Government, underestimating the value of experienced coal-miners, had conscripted them all into the armed services. By 1943, the effort was taking its toll and the severe shortage of able-bodied men working in the country’s essential industries had to be addressed. The then Minister for Labour and National Service, Ernest Bevin, decided there was only one option. He conscripted men who had signed up to fight for their country to serve in the mines instead. Those who signed up for military service and whose name was picked out of the random ballot, were destined for the mines and there was no choice about it. The program remained in place until 1948 yet, despite their significant contribution and sacrifice, Bevin Boys returning from service received no medals. Unlike ordinary conscripts, they were not allowed to return automatically to their previous pre-War professions. 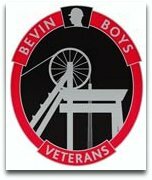 The Bevin Boys Association is trying to trace all 48,000 Bevin Boy conscripts, optants or volunteers who served in Britain’s coal mines during and after World War Two. Were you a Bevin Boy? Were you or anyone of your family or friends a Bevin Boy? Men who were conscripted directly into the mines, those who opted for mine work in preference to joining the Armed Forces, or those who were in the Armed Forces and volunteered to become miners during the period 1943-1948. Badges are currently being issued on a rolling basis.